YM at Peterborough, May 2018, with Blue Peter's Lindsey Russell. 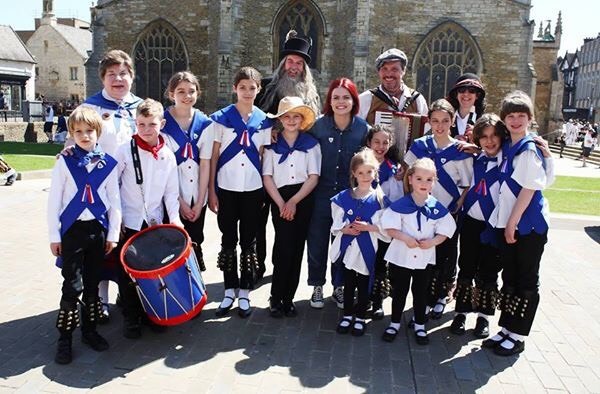 Young Miscellany is a Children's Folk Dance Group based in and around Harpenden in Hertfordshire. If you'd like to come and join us for a free trial, please email info@youngmiscellany.co.uk to find out the next practice date. 6/11/18 - The Event and Rehearsal schedule has been updated - see below. Click here for more information about our history, how to join us, and how to book us. Click here for information about the types of dance styles that we perform. Click here for information about the music that we play. Click here for information about the costumes that we wear. Click here for pictures of us dancing. Click here for pictures of the adults that help to run Young Miscellany. Click here for links to related organisations. ..or click on the [hot-links] at the top of each page. [Home] takes you back to this page. Click here for the current practice and event schedule (PDF).